One of the largest challenges for cultural producers and cultural institutions is how to reach out to new and diverse audiences. 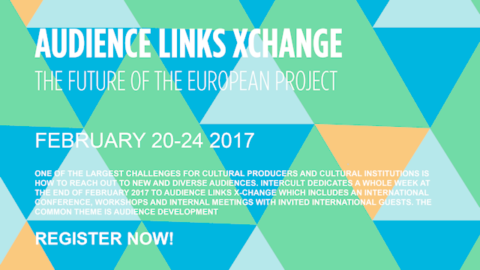 Intercult dedicates a whole week, from 20 to 24 of February 2017 to Audience Links X-change which includes an international conference, workshops and internal meetings with invited international guests. The common theme is Audience Development. CORNERS recognized audience as an important factor. The Audience Links Xchange meetings are an important part of CORNERS for creating awareness of new methods and views on the role of the audience. Audience Links Xchange is arranged as a part of CORNERS and has previously taken place in Donostia/San Sebastian (2015) and in Gdansk (2016). The conference Audience Links Xchange will feature seminars, lectures and workshops and introduce expert participants from all over Europe. This will be an opportunity to focus entirely on how to optimize methods that will ensure a maximized and diverse audience – all the while giving them the most qualitative cultural experience possible. The principal issue, and aim of the conference is to seek to answer the question: How do we reach all of society’s demographic groups? We believe that the beginning of the answer lies in exchanging knowledge and experiences across national borders. Audience development is not just about how each specific player can increase its audience numbers, it is also about questions of accessibility in a broader sense and citizen participation with the associated dialogue (‘community participation’) – which in turn is closely related to, and essential for, a functioning democracy. At the conference Feb 22nd of February 2017, at Kägelbanan, Intercult will present the Audience Development study: ’Study on audience development – How to place audiences at the centre of cultural organisations’ which is a study by Fondazione Fitzcarraldo, together with Culture Action Europe, ECCOM and Intercult, as a consortium, developed in the framework of the Creative Europe programme. The aim of the study is to provide successful approaches and methods in the area of audience development to be disseminated among European cultural organisations. The study furthermore aims to equip cultural leaders with the means to make a convincing case for becoming more audience-centric internally, (towards boards of directors, communication and artistic departments, advisory committees and other decision structures) or externally (public authorities, patrons, friends schemes, sponsors, etc). Audience Links Xchange is a series of collaboration between several organizations. This is an international conference and the language spoken althrough the conference and the workshops will be entirely in English. Full program and other news about the conference available here.